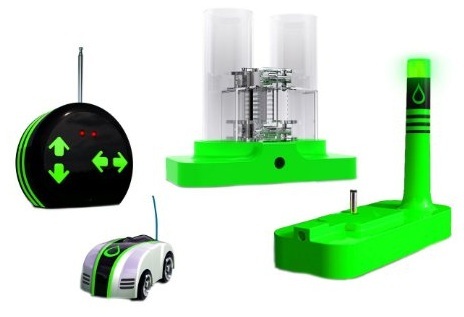 Eco-Racers hydrogen powered remote controlled green energy remote control micro cars. Introducing a brand new line of fast and fun RC mirco-cars that run on clean energy! 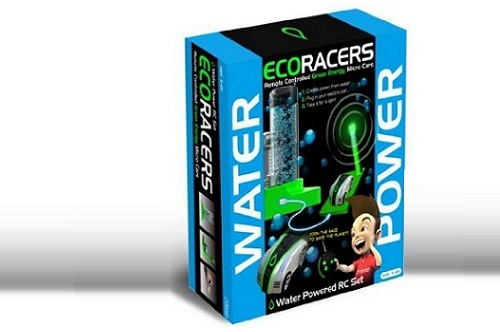 The Water Power Eco-Racer is a remote controlled micro car that comes with a real fuel cell station that stores energy using water's basic elements. The micro-car also comes with a neat docking station, a remote control, assembly guide and cool poster on how hydrogen fuel cells really work. The toy car's function is linked to a source of clean energy, combining remote control fun with educational and environmental themes. Created and develop by award-winning Horizon Fuel Cell Technologies. Bring home this revolutionary and unique, miniature fuel-cell car and hydrogen refueling station. Price: $28.99 & eligible for FREE Super Saver Shipping.